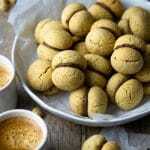 These delicious Italian cookies are called Baci di Dama or Lady's kisses. They're made with simple hazelnut and almond flour cookies sandwiched together with a chocolate hazelnut spread. Let them cool for a minute or two then blitz them in a food processor until they resemble very fine breadcrumbs. Add them to a bowl with all the other dry ingredients (photo 2 & 3). Mix all the dry ingredients together then add the softened butter. Using your hands combine the ingredients together until a dough has formed. Form it into a bowl, wrap in cling film and chill in the fridge for 2 hours (photos 4-6). Preheat the oven to 320F (160F). Once chilled remove the dough from the fridge and using your hands pick up a small amount of dough and pinch it together using your fingers so it sticks together and feels pliable. Roll it very lightly between the palms of your hands to form a small 1 inch sized ball (photo 7). Continue with the rest of the dough placing the balls on a lined baking tray then bake in the oven for 20 minutes, you'll probably need to do this in two batches (photo 8). To fill the cookies simply take one cookie and place a small amount of chocolate hazelnut spread in the middle (around 1/2 tsp). Place another cookie on top and press them together to spread the filling out evenly (photos 9 - 11). Make sure to leave the dough in the fridge for at least 2 hours. This helps relax the dough and ensure it's firm enough for rolling. When rolling the dough into small balls make sure to pick up a small piece of dough and squash it slightly between your fingers. Roll it very lightly in the palms of your hands. It's important to not use to much pressure or the dough will crumble. When the cookies come out of the oven make sure to let them cool before touching them as they'll be very soft and they need to harden before filling. You can also fill these with melted dark or milk chocolate if you prefer. Store these cookies on an airtight container for up to 1 week.